During it's heyday 11 centuries ago, the city of Angkor was at the center of the Khmer civilization. The Khmers were not only a powerful empire, they were also one of history's most creative and artistic. They created hundreds of buildings and temples that are as magnificent as they are massive. After the empire fell to the Siamese in 1431 the city was left to be devoured by the dense jungle of Northern Cambodia. It wasn't until the French explorer Henri Mouhot wrote about his discovery of the fabled "lost city of Angkor" in the 1860's that the modern world was introduced to one of humanity's greatest architectural achievements. This former Buddhist temple, Ta Prohm is one of the most popular sites at Angkor because unlike it's famous neighbors Angkor Wat and The Bayon, Ta Prohm was left exactly as it was found, so you get a real sense of what it must have been like to rediscover this majestic city. 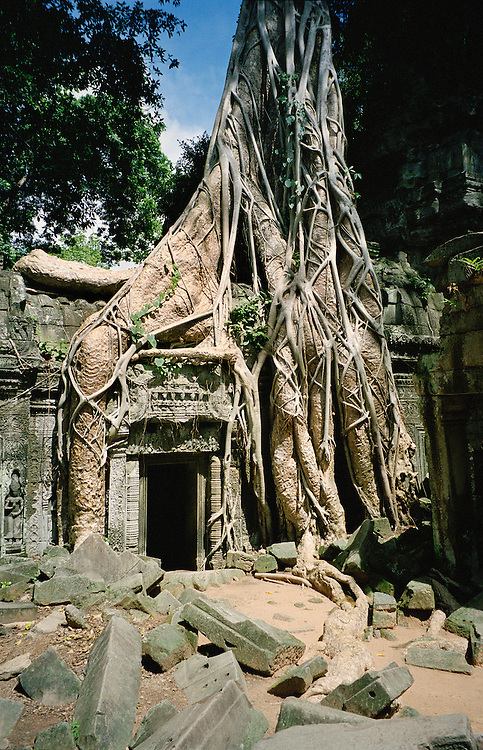 Most experts believe that these voracious trees that have overtaken the site are the very thing holding it together and if archaeologist were to remove them, Ta Prohm would simply crumble.